The diaper backpack has been a popular alternative to the diaper bag for years. The diaper backpack makes it easy to bring comfort, functionality and design into a balanced balance. With a variety of stylish prints, patterns and wearing options, the diaper backpack fits perfectly into many wardrobes and offers enough storage space for products in everyday use with your baby. The new everyday life challenges that come with a new baby can easily be solved with a diaper bag or changing backpack, because in the end it is a question of style, which suits you and your lifestyle better. The combination of diaper bag and backpack offers women and men a lot of flexibility in daily life. In daily situations, it usually shows quickly how helpful and practical a diaper backpack can be: Especially if you prefer to carry your baby or have several children, it can be easier to have both hands free. Since the backpack is a daily companion for several years, the diaper backpack is made of robust, durable and easy-care materials. The weight of the bag is evenly distributed on both shoulders and also on the hips. Mostly there are 3-in-1 wearing options with a diaper backpack. In no time at all, the diaper backpack can be transformed into a shoulder bag by applying the additional shoulder strap, or the bag in her hand can be carried in the hand or over the shoulder. If necessary, the backpack straps and buckles can also easily be stowed in the back compartment. Thanks to the stroller hooks, the diaper backpack can also be taken off the shoulder and fastened directly to the buggy or bicycle trailer. This is convenient and good for the back at the same time. The removable changing mat proves to be super practical in everyday life: it is water-repellent, offers hygienic safety and every mother can decide when and where she wants to change her baby. Nappy changing stress good bye. It also features an insulated, removable bottle holder, a utility bag, a removable compartment for food jars, stroller hooks, a key finder and a mobile phone compartment. Wet wipes or used damp clothes can be stowed in the water-repellent moisture compartment in the diaper backpack. If necessary, parents can remove the all accessories from the diaper backpack. This makes the diaper backpack the ideal companion during and after the diaper changing time. As an extra accessory for the diaper backpack, you can also buy one of our stylish changing pouches. All important diaper changing utensils are stowed compactly – the perfect accessory for spontaneous parents: LASSIG’s Changing Pouch fits into every handbag. So every day you can decide which handbag or backpack you would like to use. The on the go diaper bag for an adventure with your child. Simple but stylish? Innovative or noble? High quality and durable? What suits you and your style: Have a look around the LASSIG Online Shop! The diaper bag of today, you may wear tomorrow as a diaper backpack. Mothers can experience glittery moments with the Goldie Diaper Backpack. The diaper backpack is a true globetrotter and combines functionality with fashionable accents in a glamorous way. With the doctor case opening and well- organized inside, you have everything at your fingertips. As a twin diaper backpack, the Goldie XXL Diaper Backpack offers plenty of space to keep everything ready for a double pack. In our Green Label diaper backpack collection, we also use recycled, water- and energy-saving materials during the production of a diaper backpack. 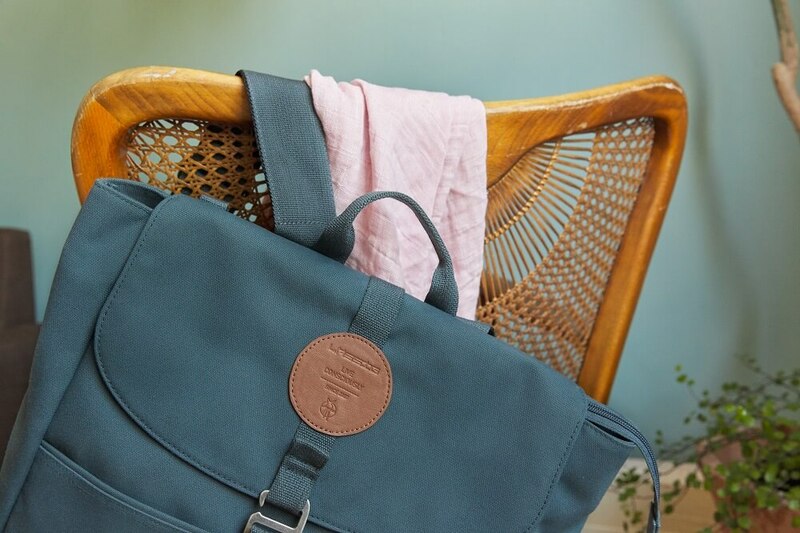 The diaper backpack Green Label Tyve impresses with its puristic look and paper-touch look. The innovative Tyvek® material from Dupont is particularly lightweight and is selected as the base material for this diaper backpack due to its tear resistance and durability. For Tyvek®, polyethylene with a particularly high material density is used. It is easily recyclable. And just because of its puristic look, it is not only suitable for women, but also can be used as a backpack for men. The little backpack Little One & Me provides extra security and offers the ultimate parent - child partner look. The reflective fabric provides variety and an extra dose of security. That's what parents like and the little ones even more! Therefore, this backpack appears as a partner look for farther and child: as a changing backpack and kindergarten backpack. The different wearing options of a diaper backpack do not only offer variety for the back, but also variety for all life situations!